Do you believe there is no better way to explore a city than from the comfort of your saddle at a relaxed pace? Then this article is for you! Read on to find the best biking trails and tips for cycling in Bratislava. Your two-wheeled adventures can begin! 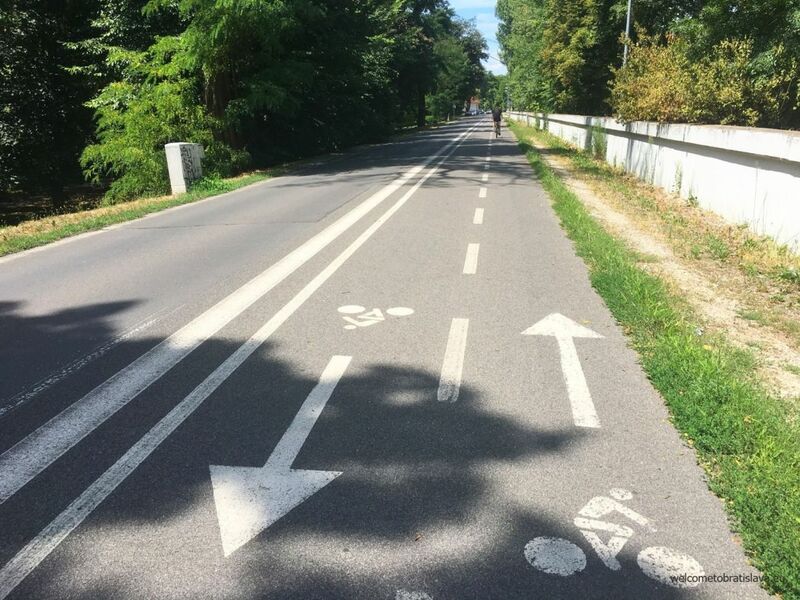 Cycling is very popular in Slovakia. Individuals, couples or families with children – you will see them all on the cycling routes that get very busy especially during the weekends. Bratislava’s cycling infrastructure consists mostly of tourist-aimed paths along the river Danube or in the Small Carpathian mountains. Intracity cycling infrastructure is very limited to few separate, unconnected lanes or bidirectional paths. 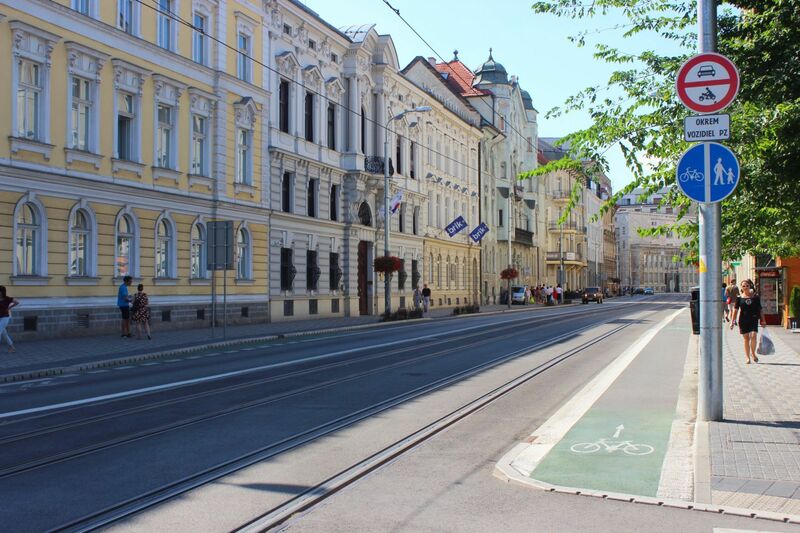 Our city center has recently received more attention in the terms of bicycle parking (racks) and pictocorridors (bicycle symbols painted on the roads). The locals are super excited about the new bike sharing system that was launched in 2018! There are quite some opportunities for recreational cycling in Bratislava and its surroundings. However, the problem of many is the transport to the given place as you often will find yourself on the main road along with the cars trying to pass you. An exception is Petržalka which is covered with three main cycling routes. There is a civic initiative called Cyklokoalícia („Cycling Coalition“) which operates bike rentals and parking racks and tries to fight for more cycling paths in and around the capital city. The easy and nice to follow paths are along the Danube river. Start at the RiverPark and get to Eurovea (or vice versa). 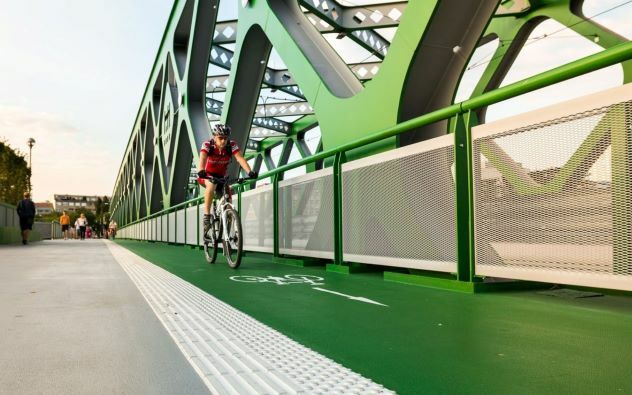 Very popular spots for biking are also our bridges. For instance you can leave the Old Town through the SNP bridge (UFO bridge) or the Old Bridge. Check the other side of the Danube bank, from its Petržalka’s side, along the Magio beach (the street where the path is, is called Viedenská cesta). You will soon be able to connect to the Petržalka dam (called also the Danube dam) which runs through the whole territory of Petržalka till the dam in Gabčíkovo. 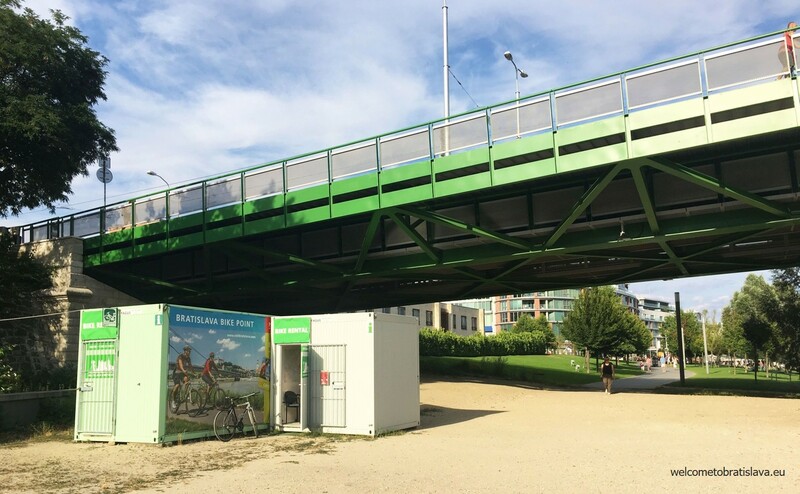 You can connect to it from the New Bridge, the Old Bridge, from under the Pristavny Bridge, at the University of Economics, at the Agip gas station or at the small refreshment buffet just behind the sewage treatment. Around 30 minute drive from Bratislava, there is a village called Hamuliakovo where you can connect to a dam as well. The Danube here is much calmer than what you can see in the center and you will find people doing fishing and trying water sports here. It is especially beautiful in the evening with the sunset. We are talking about the south bank of the Danube leading towards the Danubiana Museum. If you like the feeling of being in the nature, we recommend to go to Koliba/Kamzik, Železná studnička, Horský Park or Devínska Kobyla. These places are great especially for mountain biking. A lot of fun is guaranteed for sure! 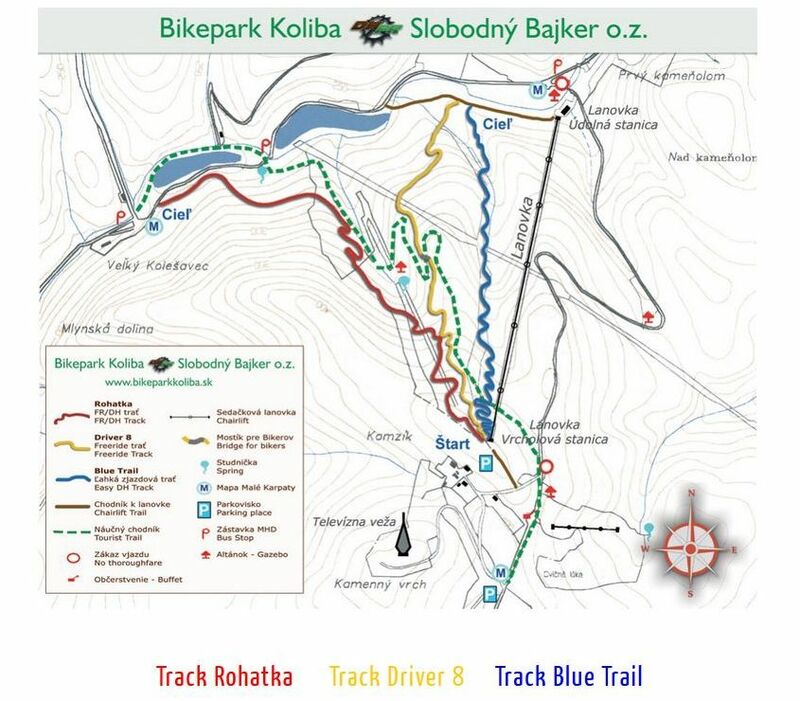 There is even a BikePark with the first official downhill bike trails in Slovakia – between Železná Studnička – Kamzík you can find three bike trails (Rohatka, Drive 8 and Blue Trail). Check this link for more info on mountain biking in Bratislava. We love the website bikemap.net which allows you to plan your biking trip according to location, bike type, length and ascent. It includes routes recommendations with maps and photos from bikers. And you can download the route you would like to try! Download their mobile app (Android, iOS) to search for popular cycle routes and start recording your own bike routes. For Bratislava offline cycling routes with offline routes and tracking, check the bratislava.cyklotrasy.sk website and download their mobile app (Android, iOS). Are you courageous enough to ride along the Danube and visit three capital cities and countries in two days? Click here to see the challenge! Rent a bike and go on your own tour of discovery! Bratislava Bike Point offers bike rentals from 15 € per day and discounts can apply for students, seniors or holders of the Bratislava City Card. Deposit of 50 €/bike is required by credit card or cash. The price includes bike rental, helmet, lock and pump and a repair kit. You can find them on Fajnorovo nábrežie, close to Starý most (Old Bridge) or Eurovea. Another option is for instance to go with the BikeBratislava. Their portfolio offers various sizes and types of bikes – trekking, mountain, road, children or tandem bicycles. They will offer you also all kinds of accessories – from child seats for family trips, children carriers (up to 2 kids) for the smallest ones, to even a basket or trailer for your dog. For untraditional lovers they have a Kick Scooter to try out! In the rent of a bicycle or scooter, renting a helmet (optional in the city, outside the city in Slovakia required), lights, pump and lock are included. Prices start from 8 €/hour. A deposit of 50 € per bike or scooter and 300 € in cash for moto-scooter in case of theft or damage is required. Various discounts applicable as well. You can find BikeBratislava on Panenská 30 Street, city center. Cycling Coalition, a non-profit advocacy expert group that aims to improve bicycle infrastructure in Bratislava and all over Slovakia, provides rental of cargo bicycles and trailers. The reason is to offer the option to carry your furniture or children with you. If you want to use their service, you need to fill out this form (unfortunately it is available in Slovak only). When the time comes that your bike needs some maintenance work, the guys at BikeBratislava will gladly get it fixed for you regardless of the day in the week when all other shops are closed. Other than that, most of the bike shops offer repair services as well. See more of Slovakia and its neighbouring countries with Freedom Treks cycling holidays. They specialize in guided and self-guided tours for all cycling levels and their varied program includes over 170 holidays in 27 countries. 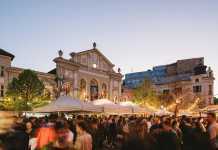 Or, as mentioned before, ride along Danube and visit three capital cities and countries in two days! Thanks for the pictures, I especially liked the bridges and parks! Great natural cycling routes that I would love to try soon. I absolutely loved the cycling routes that you shared. I haven’t been to any of them as of yet, but I plan on going as soon as I get the chance. The natural beauty looks just mesmerizing and I’m sure I’ll enjoy my cycling route. The map will surely help with getting around the various trails. Good work. Keep it up.